David Bernhardt, who has been acting secretary since Jan. 2, has worked to undo many Obama-era conservation policies. “David has done a fantastic job from the day he arrived, and we look forward to having his nomination officially confirmed!,” Trump tweeted. While Zinke reveled in public displays of his affinity for the outdoors—riding horseback while on the job, touting his enthusiasm for hunting and experience as a Navy SEAL—Bernhardt is the ultimate insider. A former Capitol Hill staffer who served as Interior’s top lawyer under George W. Bush, Bernhardt has made it his mission to master legal and policy arcana in order to advance conservative policy goals. In an interview last year with The Post, Bernhardt said he immerses himself in the details of every significant policy decision because he knows that decisions made in Washington have enormous ramifications for Americans across the country. While Bernhardt has deliberately adopted a low-profile while steering the 70,000-person department, he has used his expertise to promote the president’s agenda at every turn. He is working to streamline environmental reviews to expedite energy projects, and has promoted overhauling the Endangered Species Act to provide more certainty to developers. The push to keep Interior’s energy divisions on track during the budget impasse on track won praise from trade groups like the National Ocean Industries Association. 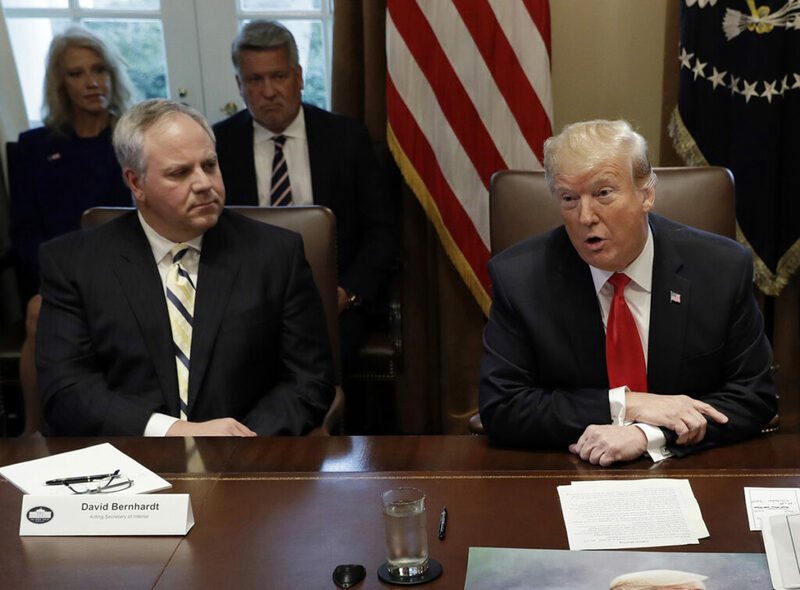 During a Cabinet meeting last month, Bernhardt sat next to the president, and he also accompanied Trump and Pence on a recent trip to the Martin Luther King Jr. memorial on the Mall. A former partner at Brownstein Hyatt Farber Schreck, he initially had to recuse himself from “particular matters” directly affecting 26 former clients in order to confirm with the Trump administration’s ethics pledge. He continues to carry around a small card in his suit pocket listing all of his current recusals, to underscore his commitment to adhering to the law. But liberal advocacy groups like the Western Values Project, which targeted Zinke while in office, have argued Bernhardt’s lobbying past disqualifies him for serving in Interior’s top post. On the day Trump announced Zinke would step down, the group launched a website to highlight Bernhardt’s work in the private sector. Even Bernhardt’s opponents, however, described him as a skilled policy and legal expert who has spearheaded the regulatory rollbacks and accelerated oil and gas leasing at a department that manages 500 million acres of U.S. land. In the last two years Interior has auctioned off more than 16.8 million acres of public land for oil and gas drilling, according to the advocacy group Center for Biological Diversity, 2.3 million of which was sold. In the first quarter of 2019, nearly 2.3 million more acres are on the chopping block. Bernhardt has played a key role in shrinking two national monuments in southern Utah, as well as pushing to open up the land now outside their boundaries to be opened up for coal and mineral mining. While opponents of the move came to public comment meetings at Bureau of Land Management offices in October, Bernhardt dismissed that criticism as coming from out of state, including California. While Zinke took extensive personal time while serving as secretary and traveled frequently to his homes in Whitefish, Mont. and Santa Barbara, Calif., Bernhardt has spent much of his time in office working at headquarters or at home in northern Virginia. While Bernhardt has made a point of consulting with Republican lawmakers since returning to Interior, his support among congressional Democrats has slipped since he was confirmed. The Senate approved him as deputy secretary on a vote of 53 to 43, largely along party lines. While the Republican margin of control in the Senate all but ensures that he will win confirmation, he is unlikely to attract as much Democratic support as he did a year and-a-half ago. House Natural Resources Committee Chairman Raul Grijalva (D-N.M.) has already indicated he intends to call Bernhardt before his panel to testify about some of the department’s policy decisions, and confirmation hearings in the Senate would allow Democrats to press for answers on an array of fronts.